I made this dessert for a 4th of July party, but loved it so much that I have made it several times since. Lemony and light, it’s perfect for these hot summer nights we are experiencing here in the PNW lately. The crust is a cookie crust. Think graham cracker crust meets favorite cookies. While shopping at Costco one day, I saw this box of lemon cookies made by the Salem Baking Company. I grew up most of my youth and young adult life in Southern California. We had multiple lemon trees in our yard. I love homegrown lemons. Nothing beats food made with freshness. Getting home from Costco I opened a pack. 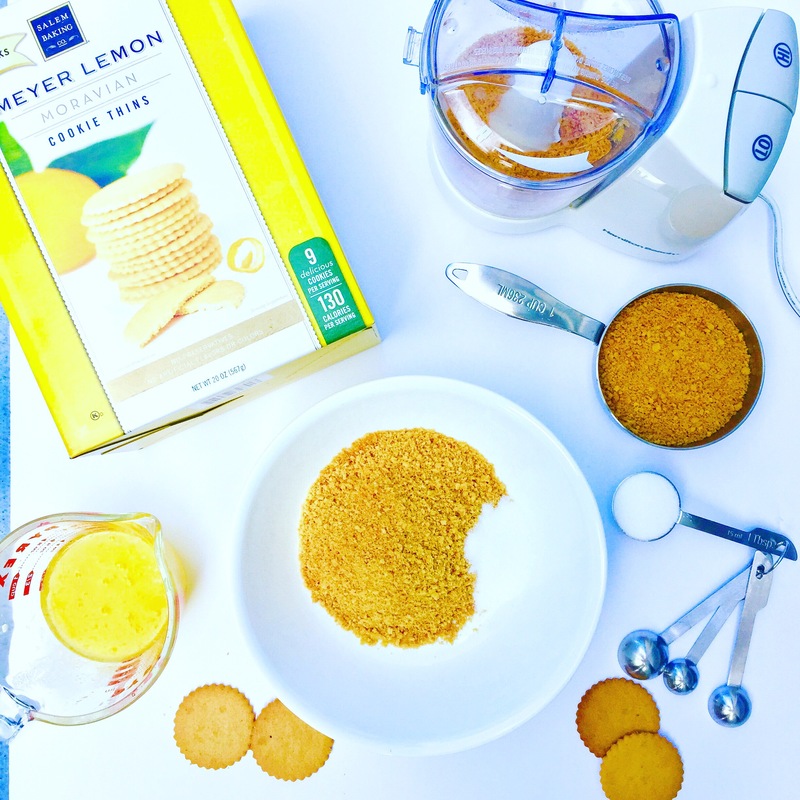 These cookies are thin, light and lemony. I’m picky and these were the perfect lemoniness. I shared some with friends while hiking and they agreed, these would make a perfect crust, thus my inspiration. In a medium-sized mixing bowl, combine the crumbs, sugar, and butter. Press the mixture into the bottom and partway up the sides of a 9″ deep-dish pie pan or 9″ baking pan of your choice. I used my 10″ white Corning tart pan. Bake in a preheated 375°F oven for 10-15 minutes, just until set and your cookies are not over-toasted. Mine took 10 minutes. Remove the crust from the oven, cool on a rack while you make the filling. I mentioned I love lemons, right? 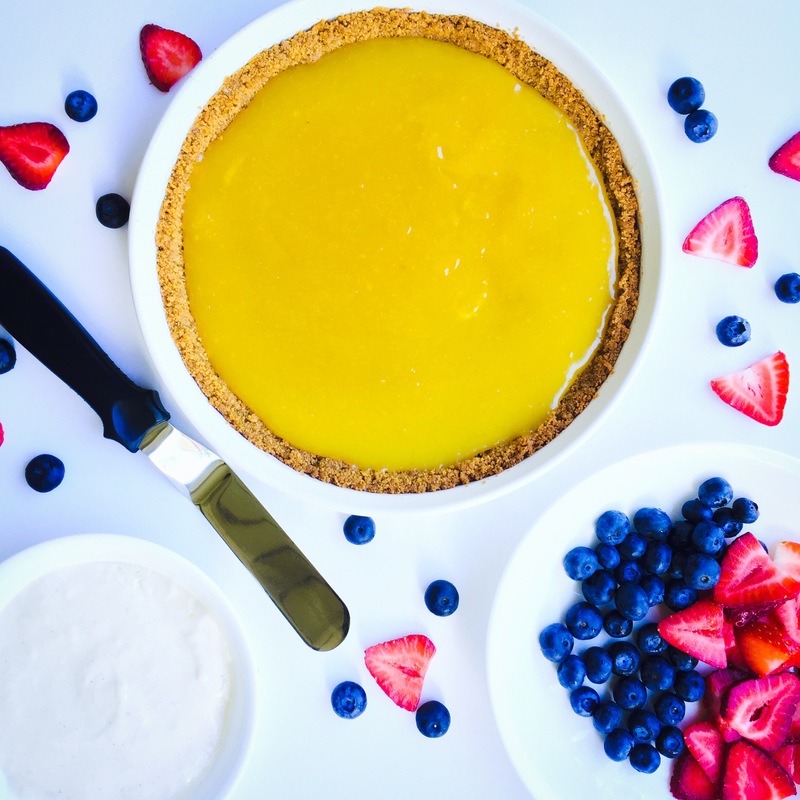 What better filling for my lemon cookie tart crust than fresh lemon curd? Yes, you can go to your local grocery store and buy lemon curd out of a jar or a can. (Insert video of Kathy shuddering in horror). Well, I don’t want you to be afraid and not attempt homemade lemon curd. It is really simple and easy and you shouldn’t be intimidated by it. What I love about homemade lemon curd or any curd of your choice really is I can make it anytime. You can make a double batch of curd and keep it in your refrigerator. Then simply pull it out, spread it into your cookie crust and finish this dessert. Any left over can go onto your English muffin, crumpets or scone the next morning, right? Here we go! Zest and juice all the lemons. Blend together lemon juice and zest with sugar. Here is where I also added my Penzeys Powdered Lemon Peel for an extra lemon punch of flavor. You could also use their lemon extract, but I didn’t want to add more liquid. Cream the butter and add to lemon sugar mixture. add in egg yolks blending each time. Mix until combined. 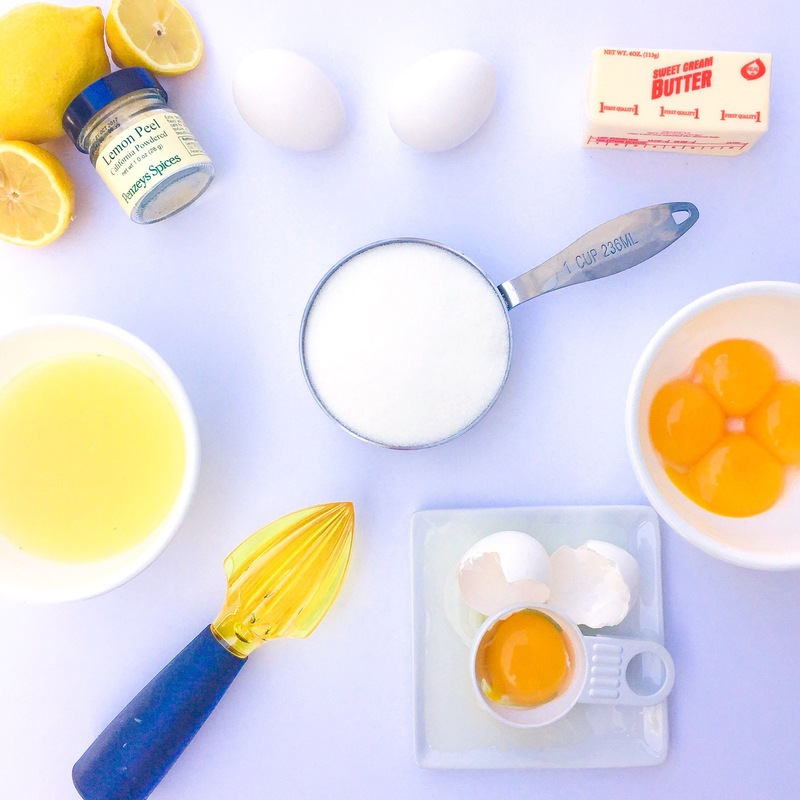 Add lemon juice, lemon zest, butter, sugar and egg yolks in a saucepan. Cook at medium-low heat, for about 10 minutes, whisking constantly until the mixture thickens. Your lemon curd will thicken at about 170 degrees. Remove from heat and let it cool. Pour into your cookie pie Tart crust or into a container if you are making it ahead of time. Refrigerate. Note: I’ve seen recipes using a double boiler method. You can do that here if you don’t want to risk potential burning or over cooking. It will take longer to get to the point you want. Do not use store-bought lemon juice. No, it isn’t the same as fresh lemons. Think about it. What do they do to allow fresh juice to stay in that container until you pull it off the shelf? Ewww. No, it won’t work. Trust me. Now you have fresh lemon curd to use for multiple yummy summer recipes. Oops! I was telling you how to make this yummy dessert! We aren’t finished yet! What is this wonderful creamy looking topping you see before you? This is the Cheesecake yumminess that was part of my collaboration with Obsessed by Portia right before the 4th of July. If you haven’t been following Obsessed by Portia, get right on that! I met Portia several years ago, when I started teaching her daughter Addie how to swim. We struck up an instant friendship as we shared life about being a mom and wife. Portia is the person who convinced me to finally try blogging. She really encouraged me for a couple of years to put my voice out there. You all have her to thank, so if you aren’t haven’t followed her, do it now! Here is the link to the recipe on her site. Check it out and then see what she is all about. You’ll end up loving her as much as I do ! In a medium bowl, whip cream cheese until smooth and creamy using electric mixer. Slowly add 1/2 of Half and Half a little at a time making sure to wait until cream is incorporated before adding more. Add lemon juice, lemon zest, vanilla and pudding mix. Continue whipping until smooth. Since I wanted to use this as my topping for this dessert, I used less half and half so it was thicker for the topping. If you want a thinner topping here is where you would add more until you have the consistency you want. Now that you have all your ingredients ready, let’s make it pretty! My lemon curd is cooled in the lemon cookie tart crust. My creamy cheese cake topping is ready to spread on top. I just need to get my berries ready. I used about a cup of fresh strawberries and blueberries. The key here is to wash your berries and then let them dry before placing on top of your dessert. I did this before making my lemon curd. Wash and slice your strawberries and place on top of 2-3 paper towels with an additional paper towel placed over the top. Wash your blueberries and use the same method to dry. Just don’t slice them. 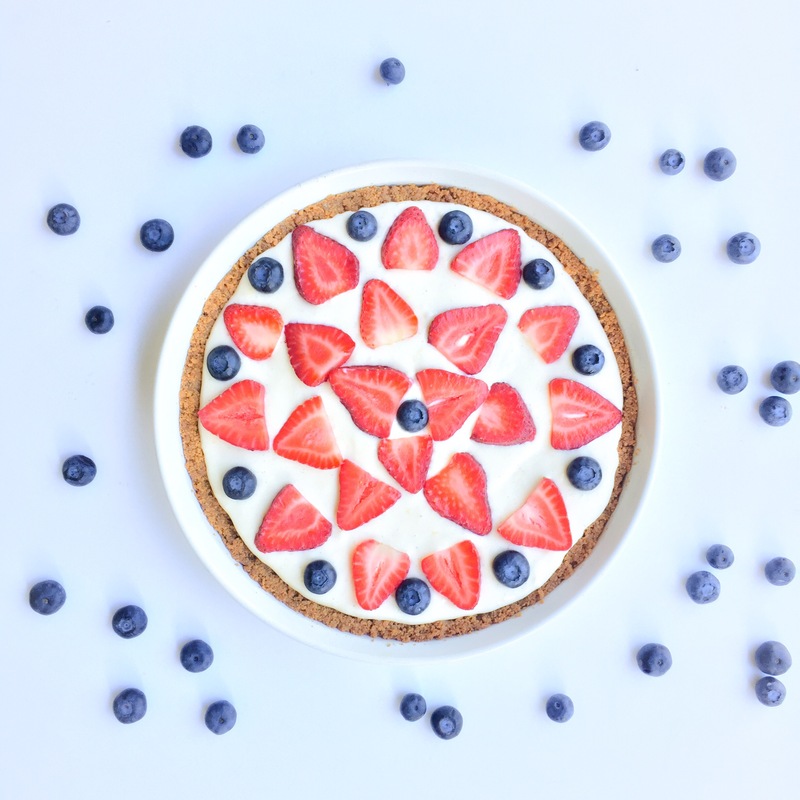 Once you have everything ready to go, spread your cheese cake topping over to lemon curd, place your berries carefully on top in whatever pattern catches your fancy that day. Since you are choosing the berries you want, the pattern can be anything you choose. Get creative. Or don’t. Once you have finished, refrigerate your masterpiece! Now, eat the left over berries. Oh! 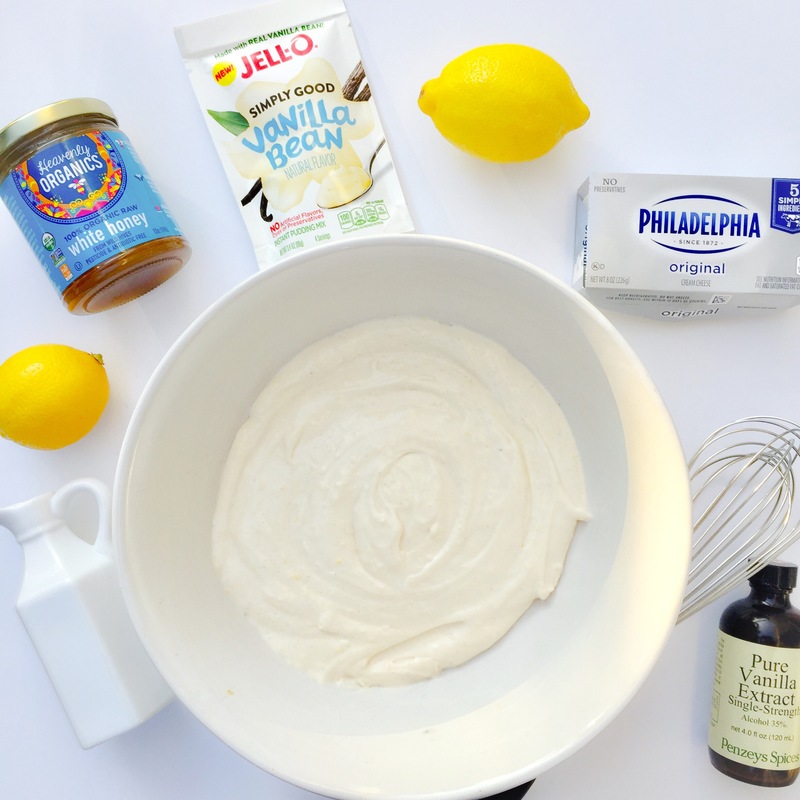 Throw on some lemon curd and any cream cheese topping. You deserve it! Thanks for joining me! I look forward to seeing your masterpiece. Don’t forget to Like me on Facebook and Follow me on Instagram! Thanks again Portia for the encouragement and support! You inspire me daily to be a better blogger!